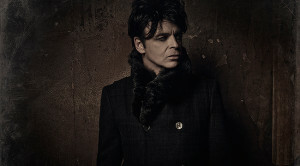 An electronic music pioneer, Gary Numan got his start in the late ’70s and would eventually influence acts such as Nine Inch Nails and Marilyn Manson. His big hit came in 1979 when “Cars” got radio airplay. He hasn’t gotten the same kind of mainstream attention since, but he’s steadily recorded and toured and last year issued Splinter, a very dark album about his personal battles with depression. We conducted this recent interview with him via email. You’ve described Splinter as being particularly dark and aggressive. What contributed to its tone? The years before were quite heavy for me. Both my wife Gemma and I were diagnosed with depression at various times and we were both on medication for a few years. Not at the same time for most of it but, nonetheless, it put a lot of strain on our marriage in particular and life in general. My career began to suffer. I didn’t write a song for nearly four years. It was just a really unpleasant thing to go through. When I started to get better I started to write again and it was those years that I wanted to write about. But, although it might seem that an album about the effects of depression would be a down and miserable thing to listen to, because it was written as I was getting better it’s come out very powerful and sometimes quite haunting. It’s not a “down” album at all. The songs provide a great showcase for your vocal abilities. Did you put an emphasis on the vocals on this outing? I have very little confidence in my vocals so, in the past, I’ve tended to swamp them with FX and drop them low in the mix, or smother them with backing vocalists. With Splinter my producer Ade Fenton wanted to drop the FX and make the vocals more upfront and naked. I was very against this to start with but that’s the way we eventually went with the album. That simple idea has given the vocals far more prominence and that has made a far greater difference than even I had expected. Talk a bit about the album’s production. Where did you record it and what were you going for in terms of the sonic qualities? The first half of it was written and recorded in the UK before I immigrated to the US. The second half was done at my new studio in Los Angeles. The main production though was done by Ade Fenton at his studio in Nottingham, England. We are both very big users of plugins and computer-based recording, so we are both fairly cutting edge with the equipment that we use. We were looking for a wide range dynamic, from huge anthemic choruses to gentle sparse moments, almost pretty but more haunting. We didn’t want it to sound as though it was made by machines so there are plenty of real musician performances on there alongside the more sculptured programmed stuff. Talk about how the importance of that first guitar you received as a teenager. I think it was a Les Paul. I had my first guitar, an acoustic, when I was very young . . . maybe four or five. My first electric came when I was about 11 or 12, I think. The Les Paul was a dream come true for a teenager and I got that when I was 16 I think, thanks entirely to my parents who were very supportive of my dreams of being a professional musician. I can’t honestly say having the guitar made a huge difference to my progress, it was just a lovely thing to have. I still have it, it still gets used on every album, every gig. It’s the one and only possession I’ve kept and it means a great deal to me. It’s been with me, literally, through every up and down of my long career and I love it very much. After starting out playing punk or new wave, you began creating an early version of what would come to be known as industrial or electronic music. What originally pushed you in that direction? It was luck really. I went to a studio to record my first album. We were a three-piece guitar, bass, drums punk band at the time called Tubeway Army. When I arrived at the studio I noticed a small synth in the control room, a Mini Moog. I was allowed to use it, not that I knew how to operate it so it was all very clumsy and amateurish, for the few days we were there. I quickly adapted my guitar based punk songs into synth-based punk songs. The record company were very unhappy but released it anyway and, surprisingly, it did okay. The next album, called Replicas, came out a few months later and went to Number 1 in the UK so it all came good very quickly. “Cars” was such a huge hit for you. Why do you think it connected so strongly? I think it was different enough to sound new and unusual, but conventional enough to sound familiar and comfortable. I think it crossed the bridge between the known and the experimental and so, for many people, it was a “new cool” thing to be into. I think that was true of The Pleasure Principle album that it came from as well. I didn’t go the full electronic route. I added synths as an extra layer to the guitar, bass, drums package that people already new and loved. When it comes to collaborations, what have been some of the highlights? I’ve really enjoyed working live with Nine Inch Nails, in the studio with Fear Factory, remotely with Battles, and many more. I don’t get involved in that many collaborations as I’m actually riddled by self doubt and I have some serious confidence issues. But, when it works, it’s a really good thing to do and I’m very happy with most of the collaborations I’ve worked on. I’ve done two with a UK artist/producer called Andy Gray that were both fantastic projects to work on. Andy is a genius and good fun to be around. What has it been like trying to sustain a career now that the music business has changed so much? My career has been long but very up and down. I’ve had some fantastic periods and some pretty grim ones as well. Keeping it going has been very difficult at times but I’ve never lost my love for it. Even in the bad moments I’ve always thought that being in a band was the best thing. The changes taking place in the business now I think are very exciting. I’m not bothered or scared at all by what’s going on, quite the opposite. For every old way of doing things that’s taken away, two new avenues seem to be opening up. We have to adapt, but we still have to fight for our rights as writers and performers. In many ways, I see this current period as something quite special and I’m enjoying the challenges that are coming with it. You seem to have gotten burst of creativity with the new album and tour. Have you started thinking about the next album? Yes. Since finishing Splinter I’ve co-written a film score for an animated movie called From Inside. That experience was very interesting as it requires a very different method than writing an album. I learned a lot and I think that will definitely help with the next album. I will start that one as soon as I get back from the current North American Splinter tour. I’m slightly reluctant to project a release date as I’m notoriously overly optimistic with such things but, with luck, it should be out in Spring 2015. Thanks for sharing this interview with Gary Numan! Enjoyed the read!